Triandrus type Daffodils are originally from Spain and Portugal. The flowers may be smaller than some others however they are very attractive with a distinct cup that is pronounced by the petals that tend to flare back away from it. Sometimes called miniature daffodils, what they lack in size they make up in appearance. Flowers vary from white to yellow, help on uptight stems and slightly nodding downwards. These are a spring flowering build that grow well in containers as well as in containers. Narcissus triandrus bulbs need to be planted at around 2 – 3 times the height of the bulb itself. After plating, water in with a liquid seaweed fertiliser. Best grown in full sun or just little afternoon shade. Good moisture is required through the period of active growth, from mid winter through spring until the foliage dies back. A dryish summer is also required. In the garden these wonderful little bulbs will require very little fertiliser in good soil. In container, use a liquid fish or seaweed fertiliser in early spring and again after flowering. A general purpose slow release fertiliser is also suitable..
A well drained potting mix is essential. Moisture is requires from mid winter through spring. Usually propagated by division, also possible from seed. Common Name – Triandrus Daffodils, Angles Tears. Flowers – White to yellow. 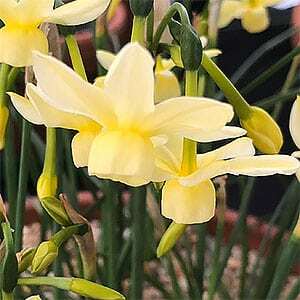 Narcissus triandrus are available for sale from the following participating nurseries.